Extra Entries: please leave one separate comment for each entry. Winner will be chosen by online random generator. Winner will be notified by e-mail on July 29, 2010 and will have 3 days to reply or another winner will be chosen. Oohh, what a beautiful headband! I can hardly choose Viki!! Such beautiful items, but here I go! http://www.etsy.com/listing/42135874/oversized-cowl-dress-with-smocked I loved this dress! I follow your blog and I tweeted! What a lovely opportunity you created here for us. What a nice giveaway, I am 100% in. I only wear a dress twice a year, maybe :), but I think this one is so cute! Thanks for having this great giveaway, Viki! The new style headband is beautiful! I follow your blog with Google Friends Connect and you are, of course, in my google reader now! ...and I just twitted about the giveaway. I don't have many followers, but maybe more people will join in! Oh I see I have to comment a few times! for more points! Hi dear there are too many beautiful goodies in your shop! it's an hard choice!!! I love everything! But I love these the most as my fave five (I just can't choose). I like Indian Summer Headband - it's so cute! I love your bib necklaces, especially Purple Galore. I have 2 faves: the Twisted Knotted Bow dress and the Owl Purse. Follow your blog with google! My favorite item is Owl Purse! My favorite item is the waterfall cowl tank top! 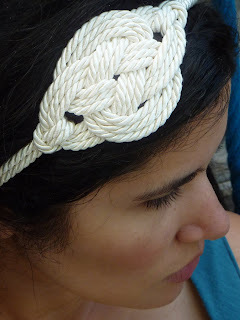 I love the Indian Summer Headband, it's so pretty! Thanks for all these entries! My favorite item is the Owl Purse- OOAK Bead Embroidered fuax Suede Bag. I've visited your shop: I love the Sailor Knot Headband almost as much as the Trivet! :) I hope I win. My favorite item is "Sunshine Droplets Statement Necklace"
My favorite is Trivet Knot nautical Belt...lovely!